Do you have a great innovative idea or product and are looking for funding? 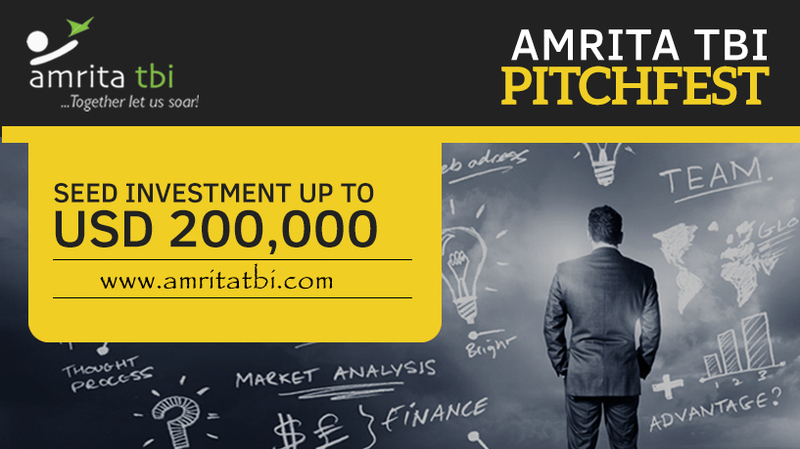 It’s time to gear up with your applications for the 6th edition of Amrita TBI Pitchfest– a platform for startups to showcase their ideas, qualify to receive a total seed investment up to USD 200,000 and get incubation space at Amrita TBI. Amrita TBI Pitchfest, one of the most popular startup events in India provides an unprecedented opportunity for startups and aspiring entrepreneurs to qualify for Seed funding. The past editions of Amrita TBI Pitchfest received a massive support from startups, investors, partners, experts, and enthusiasts. Amrita TBI Pitchfest 2017 was inaugurated by Chief Guest Dr. N Manjula IAS, Director ITBT & Tourism- Govt of Karnataka in the presence of Shri. Hemal Patel – Senior Vice President -Sophos, Shri. Chinnu Senthil Kumar – Exfinity Ventures, Br. Dhanraj – Director – Amrita Vishwa Vidyapeetham, Bangalore Campus, and Dr. Krishnashree Achuthan – CEO, Amrita TBI. The mega event was addressed by Shri Amitabh Kant, CEO, NITI Aayog, Government of India through video conference. "Amrita TBI is the rarest of the rare among the various startup incubators in India” said Shri Amitabh Kant. CEO, NITI Aayog, Government of India." Pitchfest, a unique initiative by Amrita TBI is supported by Govt. of India and Amrita Vishwa Vidyapeetham, to find the most promising startups in India. In 2017, Amrita TBI won the National Award for the Best Technology Business Incubator in India that was conferred by the President of India. 1. A 10-minute time slot for pitching your idea. 2. A 10-minute time slot for questions by the panel. Amrita TBI will complete the required due-diligence on the finalists and provide seed investments for qualified startups. Amrita TBI will provide infrastructure and incubation services at low cost across three cities- Bengaluru, Coimbatore, and Kollam. The startups can also opt to be a virtual incubatee and can operate from anywhere in India. Amrita TBI (www.amritatbi.com) is a non-profit startup incubator supported by DST, Govt. of India and Amrita Vishwa Vidyapeetham. Amrita TBI funds, mentors and nurtures ideas, startups and entrepreneurs. The startup incubator has supported 76 startups, mentored 216 startup ideas and has had 0% loss from its investments.